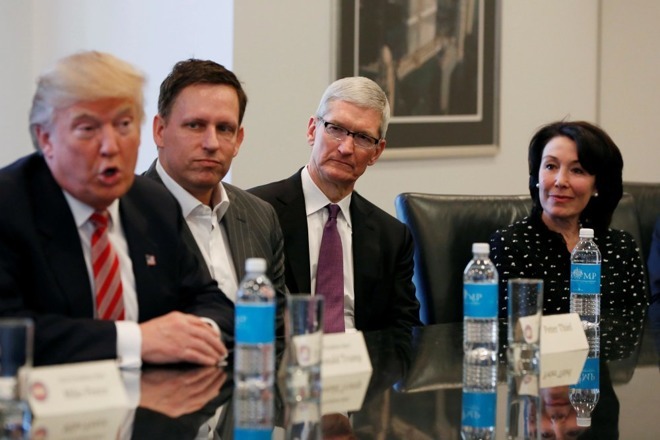 Apple CEO Tim Cook said that he pressed President Trump during a recent meeting on his tariff threats against China and asked him to find a long-term solution for young undocumented immigrants whose status is in limbo. Cook made it clear that he wasn’t happy about the tariffs on Chinese goods, while acknowledging that some people have been hurt by the trade imbalance between the U.S. and China. “I felt that tariffs were not the right approach there, and I showed him some more analytical kinds of things to demonstrate why,” Cook told Bloomberg in an interview. Cook also reportedly spoke with President Trump about the issue of DACA, the Obama-era program that allowed immigrants brought to the U.S. as children to stay in the country and live with a semi-legal status. The Trump administration ended the program last year. Federal courts have since ruled that the Trump administration did not have the authority to end the program, leaving the more than 1 million immigrants who benefit from it in limbo. Tim Cook most recently met with President Trump on April 25th at the White House, a day after attending the state dinner for French president Emmanuel Macron. In regards to Apple Music, in the interview Cook says that Apple now has more than 50 million subscribers to the service, combining paying customers with free trial users. The full interview will air next month on the “The David Rubenstein Show: Peer-to-Peer Conversations” Bloomberg TV show.